On the same day, SJBA is also organizing a Blessings Service for students sitting for UPSR, PMR, SPM, STPM, etc. examinations this year. The Blessings will be conducted by the Venerable Sangha Members. Shifu Zong Qian, whose maiden name is Sujata Yiddham, was born in Thailand in 1981. She graduated with a Higher Diploma in Hotel and Hospitality Programme and a Bachelor’s Degree in Teaching. In 2004, she resigned from her job and spent two years helping Venerable Dhammananda, (a Theravadian nun) in the Buddhist Woman Residence project and later became a Thai nun (mae chee). In 2009, Shifu Zong Qian met her current Teacher, Ming Cen Shifu (Ã÷á¯Ê¦¸¸), and in 2010 became a Samaneri at Xiang Lin Lan Ruo nunnery (ÂíÀ´Î÷ÑÇÏãÁÖÀ¼ÈôËÂÔº) in Bukit Mertajam, Malaysia. She finally received her full Bhikkhuni’s ordination in 2011 at Fo Guang Shan Monastery in Taiwan. Please invite your Mandarin speaking relatives and friends to join us. The gift of the Dhamma is the highest gift. 5) This morning’s Dhamma talk by Sis Kah Yein “An honest look at Metta”. Dr Chan Kah Yein holds a Ph.D in Mathematics Education. She is the founder of AnimalCare, a charity for stray animals. She also gives public talks on ways to lead a more spiritually fulfilling life. To date, she has written eight books and many of her talks have been produced on audio CDs, all, for free distribution. With a love for all things small and simple, her motto is to embrace simplicity and travel light in life. May You Be Well & Happy, Always! (1) SJBA is making the invitation to Sayadaw U Rewata on 22nd July 2013, Monday, 7.30pm to enter Vassa (Rains Retreat) in SJBA. The program will include taking the 3 Refuges and observe the 5 Precepts, formal invitation to the Sangha Members to stay in SJBA for the 3-month Vassa so that we can organise the Kathina, determination by the Sangha, offering of robes and requisites to the Sangha followed by chanting and sharing of merits. Upon accepting SJBA’s invitation, Sayadaw U Rewata will enter Vassa in SJBA the next day, 23rd July 2013. Members and devotees are invited to witness and participate in this Vassa Entry Ceremony. (2) Members and devotees are invited to witness this Vassa Entry Ceremony and also to participate in the 5th Day Vassa Chanting on 27th July 2013, Saturday, 7.30pm, to commemorate the day the Buddha taught the Anattalakkhana Sutta to His first 5 disciples of the Buddha who had by listening to this sermon, meditating on the five aggregates of clinging and realizing 3 higher stages of supramundane knowledge that lead them to the attainment of Arahantship. 2) SJBA is inviting Ven. Sayadaw U Rewata on 22nd July 2013 (Monday), 7.30pm to enter Vassa (on 23rd July) in SJBA. The program will include taking the 3 Refuges and observe the 5 Precepts, formal invitation to the Sangha Members to stay in SJBA for the 3-month Vassa (so that we can organise the Kathina), determination by the Sangha, offering of robes and requisites to the Sangha followed by sharing of merits. Members and devotees are invited to witness this Vassa Entry Ceremony (which also commemorate the First Sermon (Dhammacakkapavattana Sutta by the Buddha) and also to participate in the 5th Day Vassa Chanting on 27th July 2013, Saturday, 7.30pm, to commemorate the day the Buddha taught the Anattalakkhana Sutta to His first 5 disciples of the Buddha attained Arahantship after listening to this sermon. 3) Our Mandarin Puja Service will be from 11.30am to 12.30pm today (14th July) with a Dhamma Talk on “Metta” by Sis Tan Yee Yong. Please invite your Mandarin speaking relatives and friends to join us. The gift of the Dhamma is the highest gift. 4) This morning’s Dhamma Talk will be given by Ven. Sayadaw U Rewata. Sayadaw U Rewata was born in 1955 in Thonse, Myanmar. He graduated in 1980 with Bachelor of Science at the Rangoon University. He was ordained in 1983. He followed Pariyatti and Patipatti under the guidance of Most Venerable Chanmyay Sayadaw U Janaka Bhivamsa. He has travelled widely to many countries like Japan, USA, Canada, India, etc for missionary work, teaching Metta Bhavana, Vipassana Bhavana, Suttanta Recitations, etc. He served as the Abbot in Hmawbi, Yangon in 2004 to 2006, and also has been the Abbot of the Satipatthana Vipassana Association, Springfield, USA. Sayadaw U Rewata is currently in Subang Jaya Buddhist Association to support its Dhamma missionary work. 2) SJBA Sunday Dhamma School is organising a Food & Fun Fair on 14/7/13 today to help raise funds for SJBA Temple Building Extension. Coupons can be purchased at SJBA office. Your support and dana is very much appreciated. 3) SJBA is inviting Ven. Sayadaw U Rewata on 22nd July 2013 (Monday), Full Moon Day, 7.30pm to enter Vassa in SJBA. The program will include taking the 3 Refuges and observe the 5 Precepts, formal invitation to the Sangha Members to stay in SJBA for the 3-month Vassa (so that we can organise the Kathina), determination by the Sangha, offering of robes and requisites to the Sangha followed by sharing of merits. Members and devotees are invited to witness this Vassa Entry Ceremony (which also commemorate the First Sermon (Dhammacakkapavattana Sutta by the Buddha) and also to participate in the 5th Day Vassa Chanting on 27th July 2013, Saturday, 7.30pm, to commemorate the day the Buddha taught the Anattalakkhana Sutta to His first 5 disciples of the Buddha attained Arahantship after listening to this sermon. 4) Our Mandarin Puja Service will be from 11.30am to 12.30pm today (14th July) with a Dhamma Talk on “Buddhist Etiquette” by Sis Tan Yee Yong. Please invite your Mandarin speaking relatives and friends to join us. The gift of the Dhamma is the highest gift. 5) This morning’s Dhamma Talk is on “FROM PERCEPTION TO DECEPTION” which relates how easily we are fooled by our perception of sensory objects (“illusion”) and by our own memory, imagination and expectation (“delusion”), and how we sometimes readily fool ourselves and believe in our own self-deception. Our Speaker, Brother Billy Tan is a Professional Trainer and Business Development Consultant who has trained countless corporate executives and business professionals in more than 20 countries over the past three decades. Bro. Billy is a Certified Master Practitioner of Neuro-Linguistic Programming (NLP), as well as being certified by the International Association of Counselors and Therapists, USA, in Clinical Hypnotherapy. In recent years Bro. Billy has conducted several professional training programs for resident and visiting Monks at the Buddhist Maha Vihara, Brickfields, in the areas of Emotional Intelligence, Communication, Professional Presentation, Public Relations, Community Services, Leadership, and Management. In sharing the Dhamma, Bro. Billy researches discoveries from the fields of Neuroscience and Psychology to present teachings of the Buddha from a scientific perspective. COUPONS AVAILABLE AT SJBA @ RM 10/= a booklet. ALL PROCEEDS GO TO THE SJBA BUILDING EXTENSION FUND. COME GET YOUR BREAKFAST AND LUNCH. MELAKA CENDOL SOLD BY DATO KENNY CHAN! 2) SJBA Sunday Dhamma School is organising a Food & Fun Fair on 14/7/13 (with presale morning breakfast with scones, Malaysian breakfast, etc. 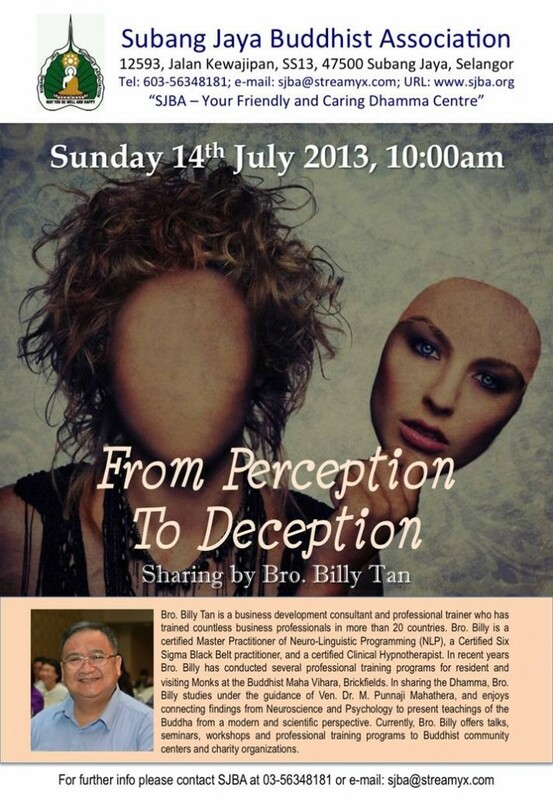 on 30/6/13 and 7/7/13) to help raise funds for SJBA Temple Building Extension. Coupons can be purchased at SJBA office. Your support and dana is very much appreciated. 3) Our Mandarin Puja Service will be from 11.30am to 12.30pm today (7th July) with a Dhamma Talk on “Life of the Buddha” by Sis Yee Yean. Please invite your Mandarin speaking relatives and friends to join us. The gift of the Dhamma is the highest gift. 4) This morning, Ven. Sayadaw U Rewata will lead us in chanting and meditation with a short Dhamma Talk. Sayadaw U Rewata was born in 1955 in Thonse, Myanmar. He graduated in 1980 with Bachelor of Science at the Rangoon University. He was ordained in 1983. He followed Pariyatti and Patipatti under the guidance of Most Venerable Chanmyay Sayadaw U Janaka Bhivamsa. He has travelled widely to many countries like Japan, USA, Canada, India, etc for missionary work, teaching Metta Bhavana, Vipassana Bhavana, Suttanta Recitations, etc. He served as the Abbot in Hmawbi, Yangon in 2004 to 2006, and also has been the Abbot of the Satipatthana Vipassana Association, Springfield, USA. Sayadaw U Rewata is currently in Subang Jaya Buddhist Association to support its Dhamma missionary work.